The Courtyard by Marriott Dubai Green Community is one of Dubai’s newest hotels with a fantastic waterfront location, not too far away from the Jebel Ali, a buzzing and lively port town on the outskirts of Dubai. There are countless golf courses not too far away from Marriott Dubai Green, making this hotel a fantastic base for your Dubai golf Holiday. On top of this, the Al Maktoum International Airport is only a short drive away from the hotel, meaning that you can be on the first tee in time. The hotel’s modern ambience, sophisticated decor and excellent service make Dubai Green a must stay on your next golf holiday to the UAE’s most popular golfing destination. The hotel offers fantastic 4* accommodation including excellent facilities, meaning guests have plenty to do when they have some some downtime away from the course. The fully equipped gym including free weights and cardiovascular equipment is open to all guests and there is also a running trail through the green community if guests want too keep up with some exercise while on holiday. When it comes to food & drink at Dubai Green, you are spoilt for choice with fantastic choices available including the popular and relaxed SOBO poolside eatery. Here, you can enjoy delicious Arabic snacks including mezze and grills topped off with a wide ranging list of crafted cocktails. If Italian is your option, the Cucina Italian Option boasts delicious authentic flavours coming straight from the wood burning oven. The restaurant also offers fantastic lake views from the outdoor seating area, which is high recommended when eating at Cucina. If you want a more relaxed dining atmosphere, head over to the Neighbourhood, which offers British Gastro pub favourites along with panoramic of the lake and the nearby green community. 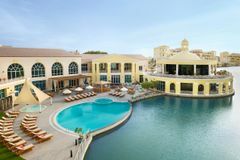 As mentioned, the Dubai Green Hotel is located nearby the Jebel Ali port town, which offers plenty to do and has even played host to countless high profile polo and racing events at the famous Ghantoot Racing Club. The iconic Palm Islands are also not too far away from the hotel and is definitely worth a visit or even a walk on a cool day. The famous Emirates Golf Club, which has played host to the European Tour’s Dubai Desert Classic for many years is only a short drive away from the hotel,meaning you can have a spot of breakfast and then be on the first tee in minutes ready to start your round. There are also plenty of other golf courses not too far away from the hotel including the Els Club, Arabian Ranches and the Address Montgomerie Dubai Resort.